The month started off cooler than normal as this year’s very active monsoon continued well into August 2013. High pressure began to dominate the region again in the middle of the month. Note the large number of days with daily mean temperatures equal to or greater than 78°F. This was mainly due to the excessive nighttime heat (note the blue line above the climatological normal lows), but also the daily high temperatures in the mid to upper-90s. Denver’s temperature was above normal for the past four months in a row. May 2013 ended a short streak of four months with below normal temperatures. October 2012 broke last year’s extreme summer heat including the warmest month in Denver history: July 2012 (a mean of 78.9°F which was 4.7°F warmer than normal!). Through September 4th, 2013, there were 50 90°F+ days in 2013, which ties three other years (1960, 1964, 2011) for 10th most 90°F days. As of September 5th, the NWS forecast calls for an additional four days with maximum temperatures equal to or greater than 90°F, which would push the yearly total to 54, good for a tie for sixth place. 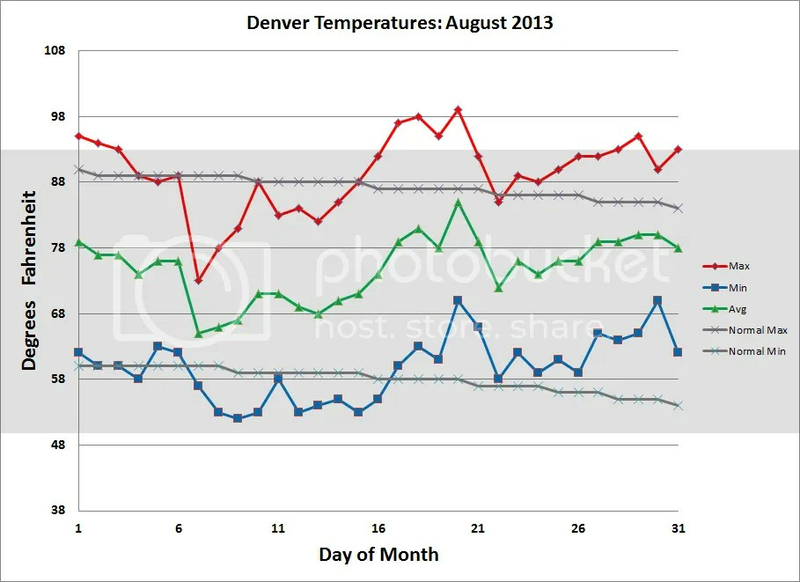 Last year, the hottest summer on record for Denver, there was an astounding 73 90°F+ days! Thankfully, this year also featured far fewer 100°F+ days than 2012: 2 instead of 13 (a record number). I haven’t determined if the NWS (or anyone else) collects record high minimum temperatures (warm nighttime lows) in a handy table, chart, or time series. Denver’s 68°F on Sep. 3rd was such a record (previously 67, set in 1947), as was Sep. 4th’s 69°F (previously 64°F, set in 1995 and previous years). I’m curious how Denver’s nightly lows have changed in the past 100+ years. If I find or put something together, I’ll include it in a future post..
Precipitation was greater than normal during August 2013: 2.78″ precipitation fell at Denver during the month instead of the normal 1.69″. Most of this fell at DIA on the 22nd of the month (1.94″). This wasn’t the case for every location in the Denver metro area however since precipitation is such a variable phenomenon. Precipitation that fell during the past couple of months alleviated some of the worst drought conditions in northern Colorado. The link goes to a mid-August 2013 post. Almost all of Colorado continues under at least some measure of drought in early September 2013 (the exception being along the Front Range in northern Colorado, which received almost daily monsoon rainfall in August). The worst drought conditions (D4: Exceptional) continue to impact southeast Colorado however. The good news is this area shrank in the last month or so. Colorado still needs the jet stream to substantially shift position this fall and next spring in order to receive the amount of precipitation required to break the long-term drought. The last NWS 3-month projection didn’t indicate that this was likely to happen. Hopefully, for the state’s sake, I hope the NWS is wrong. I have written hundreds of posts on the effects of global warming and the evidence within the temperature signal of climate change effects. This series of posts takes a very different look at conditions. Instead of multi-decadal trends, this series looks at highly variable weather effects on a very local scale. The interannual variability I’ve shown above is a part of natural change. Climate change influences this natural change – on long time frames. The climate signal is not apparent in these figures because they are of too short of duration. The climate signal is instead apparent in the “normals” calculation, which NOAA updates every ten years. The most recent “normal” values cover 1981-2010. The temperature values of 1981-2000 are warmer than the 1971-2000 values, which are warmer than the 1961-1990 values. The interannual variability shown in the figures above will become a part of the 1991-2020 through 2011-2040 normals. If temperatures continue to track warmer than normal in most months, the next set of normals will clearly demonstrate a continued warming trend. Categories: drought, NOAA, science | Tags: 100F days, 90F days, climate, Denver climate, Denver precipitation, Denver temperature, interannual variability, science, temperature record, weather | Permalink.